Last post I was discussing how time is flying by, and around a year ago today E’s niece M was born. I still remember the first picture E sent me, and the first cuddle with the new baby. It honestly feels like yesterday. And here we are a year on celebrating her first birthday! And first birthdays need a special dress, right? We’ve discussed chambray and shirt dresses on the blog over the last few weeks, but there is still one more dress in this three part series of the best dress styles for Summer! The final dress style you need in your wardrobe this season is the maxi. Duh! Floaty, feminine and perfect for wearing day or night, the maxi is back again this Summer in a big way. Throw one on with a pair of sandals and some cool shades for day time fun or doll it up with a bold lip and some bling bling for the evenings, the maxi really deserves a place in your wardrobe this season. It’s a justifiable purchase, I promise. 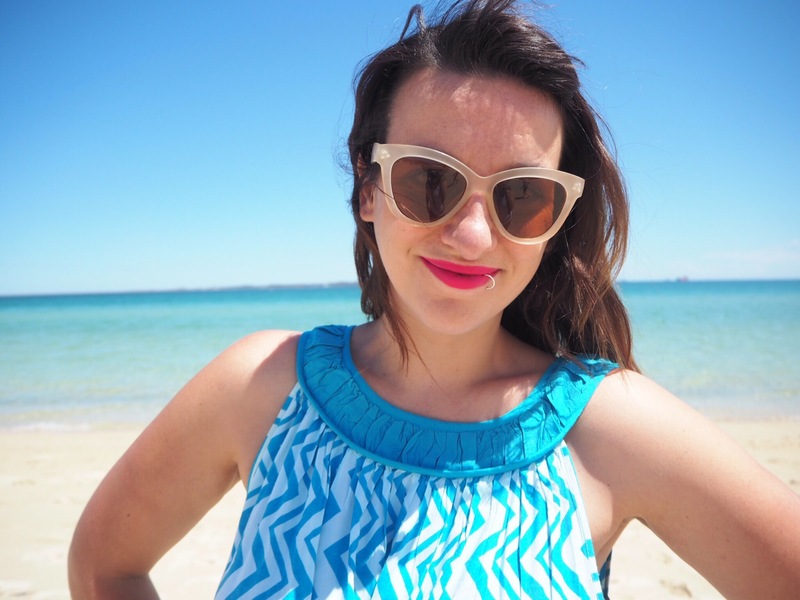 I only really got into the maxi dress late last year (see how I dolled up a plain maxi here) if we’re being honest here. 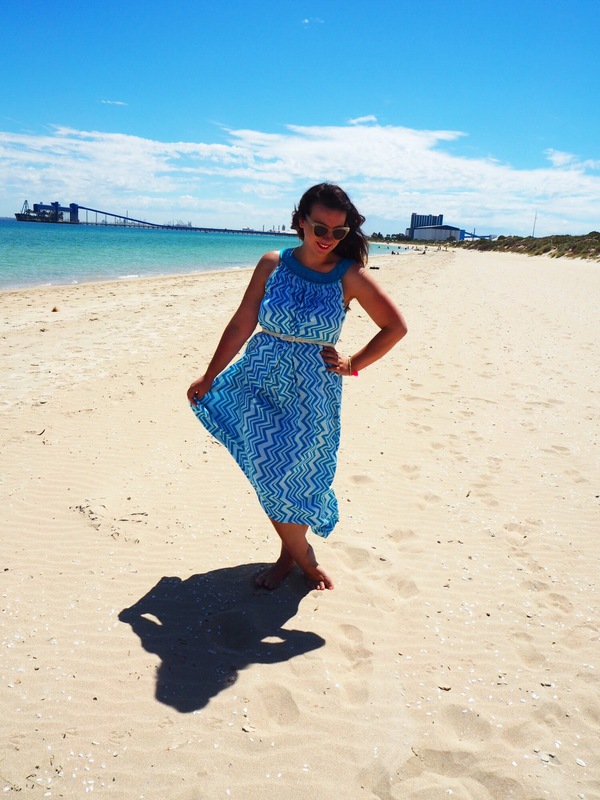 I’m normally more of a flippy skirt, skater dress kind of lady, but after noticing all the gorgeous maxi dresses on show via the #everydaystyle hashtag on Instagram I knew I needed one (or more) of my own. Being the colour freak I am though it needed to be out there and still me though, and this gorgeous frock from Lucciola ticked all the boxes. Vibrant colour, quirky pattern, cool detailed neckline and long enough to sweep the floor, when I saw this dress online I knew it was made for me! Being chesty I was a little paranoid about the cut of the dress, but this one works perfectly with a strapless bra! It’s high cut enough so you don’t see much skin and drapey enough to avoid a “uniboob”. The dress doesn’t necessarily require a belt (be a Grecian goddess!) but I love to emphasise my waist and I liked the addition of a thin belt to drag it all in and show off the curves. If you’ve got it, flaunt it… Right? The material is thin and breathable for Summer heat and you can shop it right here, right now! The dress also comes in pink (and a mini version) and we’ve got a lot more Summer on the way so if you’re looking for a bold maxi this one is a great bet! Plus the label is a local Australian one, and you know how important it is to shop local! My favourite thing about Lucciola’s range of resort wear is the versatility of the pieces. 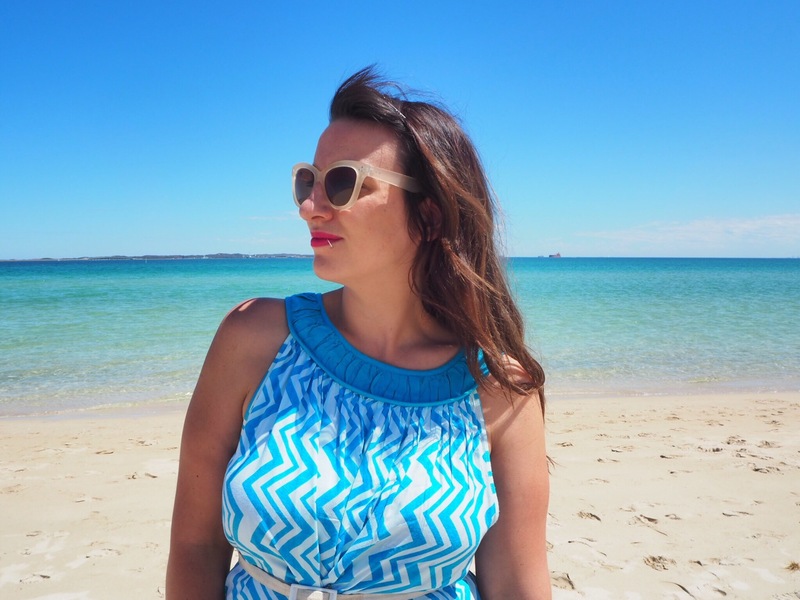 I wore this dress to M’s 1st birthday party at the beach over the weekend but could have easily dolled it up for an after five wine with a fancier pair of shoes and a chic up do. The great thing about resort wear is it is designed to be worn from beach to bar. Clothing that suits my lifestyle is always appreciated! I’ve always loved bright pink with bright blue so I went with a long lasting colour stain on my lips. As well as surviving all day at the party (plus two dips in the ocean), a bright lip screams Summer days! But if you’re more of a lass who loves classic colours and chic styles then you’ll find it simple to find a maxi for you too. They basically come in every style, colour and fabric, and you can wear as little or as much make up as you want with them. 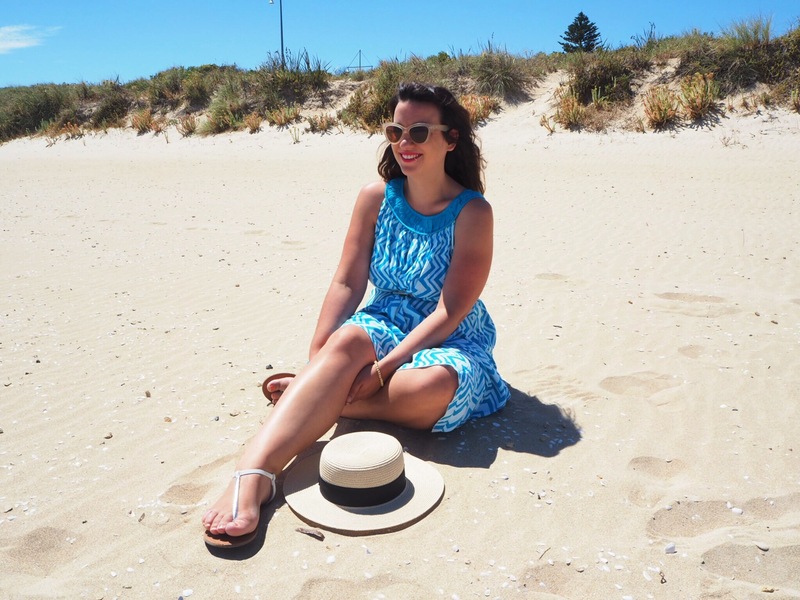 I also went with a pair of simple sandals, knowing full well I’d be taking my shoes off as soon as I hit the sand, and I’m obsessed with Kmart’s new range of Summer foot wear. My trusty boater hat also made its way to the beach because we all know how important protecting your skin in the sunshine months is. 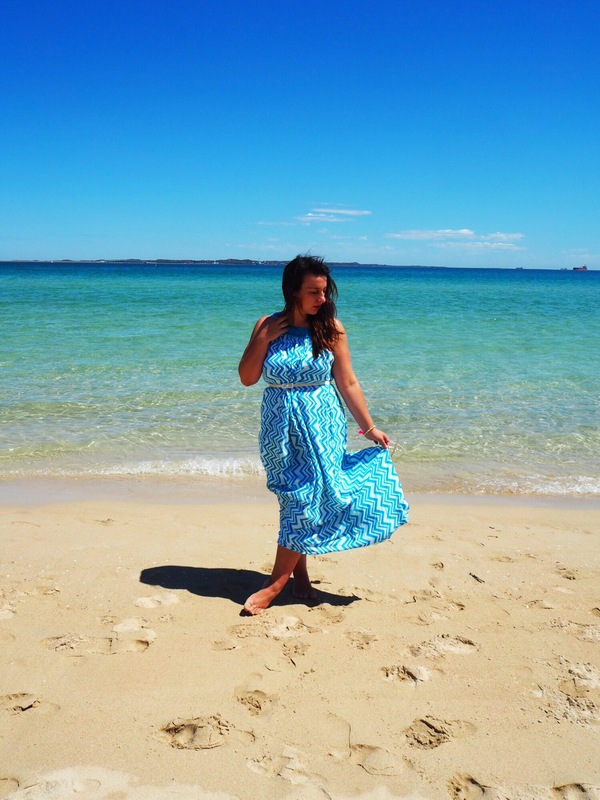 For more maxi inspiration check out how my favourite bloggers have styled this Summer staple. Demelza from DemelzaBuckley.com shows us how to style a glamorous maxi for unique festivals here, Jo at iCurvy shows us how to take a maxi dress from day to night here and Lily at Frocks and Frou Frou shows us how to glam up a plain maxi here. 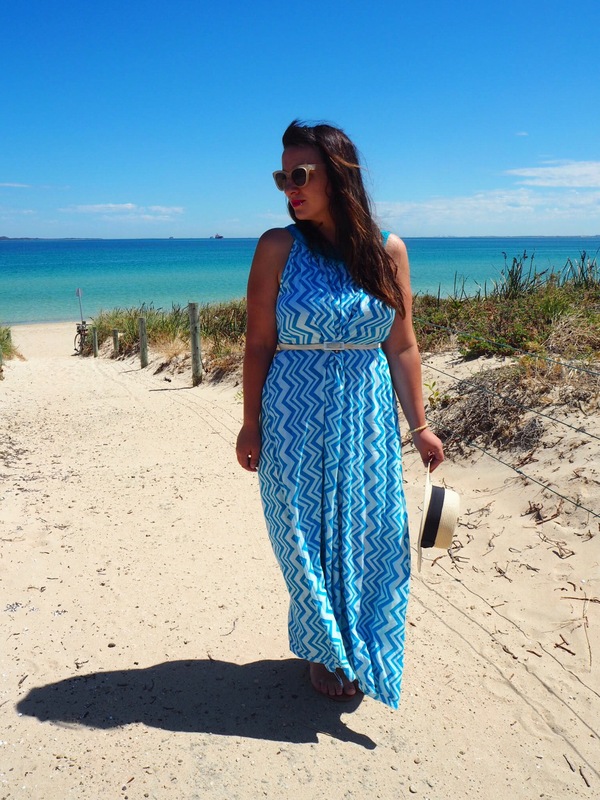 Plus if you’re on Instagram my girl Kimba at KimbaLikes is currently rocking the maxi for her StyleItProject for the month. More on how to get involved here. Told you they suit everyone! 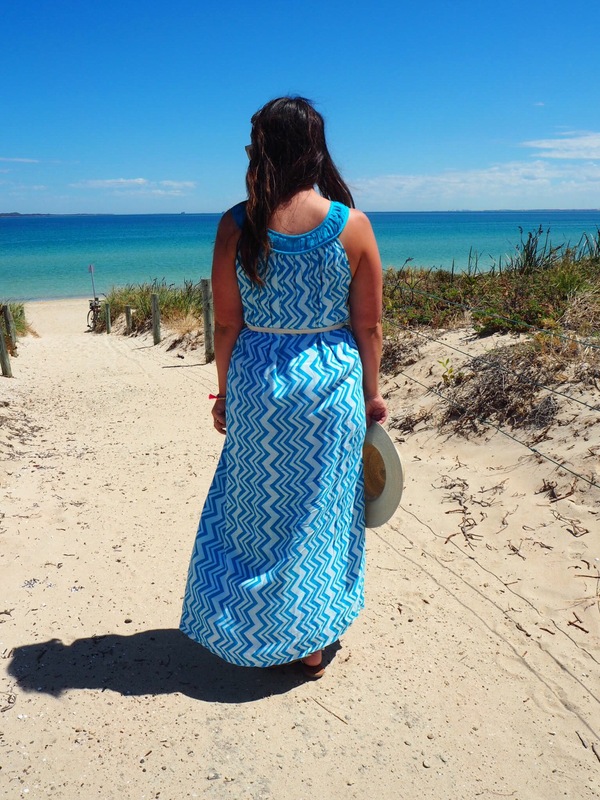 Do you own a maxi dress? Where do you wear yours? Are you more of a casual or glam girl? 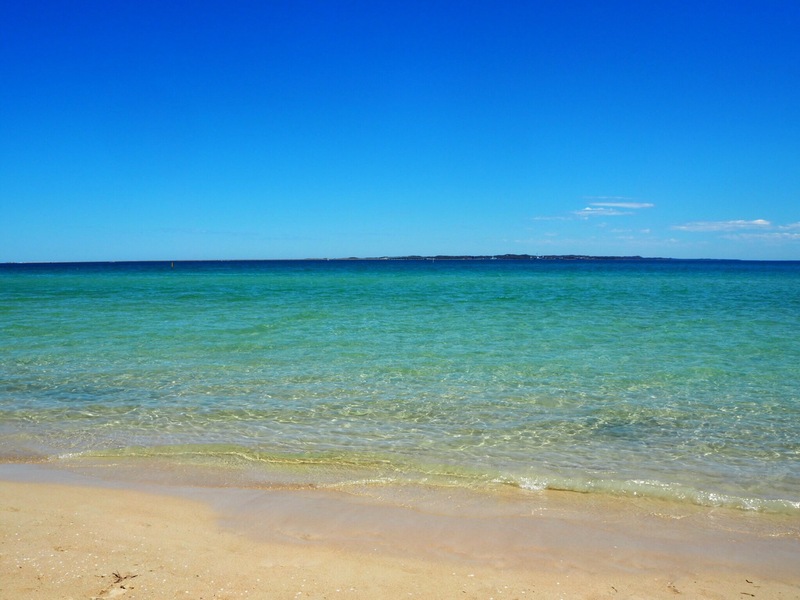 Beautiful colour on you, and beaut pics at the beach. This dress is gorgeous on you! I love the colour, pattern, design and especially the versatility of it! I have strict standards for maxis as I covered recently but I’d be happy to wear them more if I could find more that met my guidelines! Love this on you! Hahaha always good to have guidelines lady! Next PostP E R S O N A L : Cut yourself a break & those small wins.